Forty years on, the early 1970s are increasingly seen as a golden age for the singer/songwriter and new generations are discovering the depth and creativity of performers who have long since ascended their own musical Mount Olympus. Joni Mitchell, Carole King, James Taylor and Carly Simon… the list of deities resonates with true greatness and their influence is keenly felt by today’s troubadours. 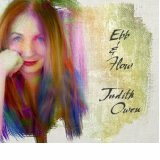 Listening to Judith Owen’s new album, Ebb & Flow, which is a self-confessed salute to their legacy, it is fascinating to hear just how much that influence reverberates with relevance. The hunger for thoughtful, personal, meaningful lyrics is greater than ever after a prolonged period in which pop’s dependence on production technology and sampling has seemed irreversible. Owen has enlisted the help of several musicians who were key to the success of some of the totemic albums of the age, including drummer Russ Kunkel, bassist Lee Sklar and guitarist Waddy Wachtel. And there’s a poignant, unlisted nod to Carole King to catch the listener out at the end of the record. But Ebb & Flow is only superficially a retro ‘tribute’ album. Owen has a consummate skill for referencing themes and riffs that evoke a 1970s spirit while remaining fresh and contemporary. Witness her deft handling of that hardy chestnut “In the Summertime”, which strips away the nonsense and becomes a rather touching, nostalgic skip down the memory lanes of youth. Overall, however, the substance of the album is more than nostalgic. Loss and separation are the leitmotifs, with Owen seeking resolution and acceptance of the pain through graceful lyrics that explore the visceral impact of these experiences. Catharsis triumphs over anguish and agony, although the wounds remain. Nowhere is this crystallised more effectively than in the twin tracks that deal with the loss of her parents: the heart-stopping “I Would Give Anything” and “You are not There Anymore”. The life of the troubadour provides the meat for songs like “Hey Mister, That’s me up on the Jukebox” and “I’ve Never Been to Texas”. Elsewhere, Owen takes good old-fashioned betrayal as a core theme and teases it into a couple of deceptively low-key, completely lacerating sets of lyrics (“You are not my Friend” and “Some Arrows go in Deep”). Fluid and fluent, Ebb & Flow envelops you in its multi-tiered exploration of hard-learned lessons, in which realisation is never subsumed by bitterness. It’s a real grower. Judith Owen has two songs on ebb and flow , “you are not my friend and one about arrows going deep. You indicated they are lacerating songs. What are they about or could you provide the lyrics? I am not sure if i will purchase or not. Hi, Thanks for your question. As I suggested in my review, the lyrics are lacerating in a low-key way – devastating little barbs of the realisation of betrayal. Of course, that’s my interpretation. Judith Owen says one of the album’s main themes is a bitter-sweet duality – and I think that’s embodied in these two songs, which she says are about emotional vulnerability, albeit shot through with glimpses of hope and salvation. I can’t reproduce the lyrics here, as that would be a copyright infringement. But perhaps if I put a call-out on Twitter, the lady herself might be persuaded to enlighten us further!